And so, after the disaster of Beneath the Planet of the Apes, we return. After the Earth burned in the previous movie, there seemed to be nowhere else to go. Certainly, that was Charlton Heston’s plan. 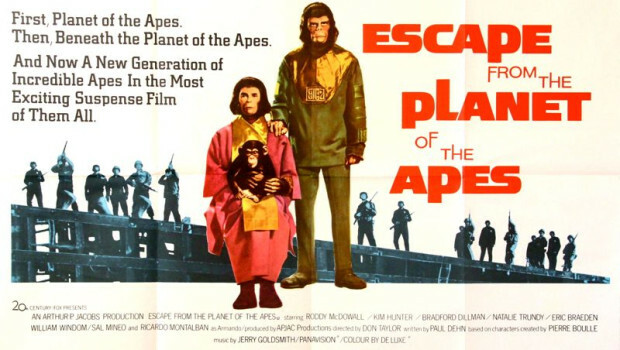 However, it turns out that a chimpanzee named Dr Milo found Heston’s spaceship, and he, along with Zira (Kim Hunter, totally my favourite character in the series so far) and Cornelius (the returning Roddy McDowall), travel back through time in order to Escape From the Planet of the Apes. So rather than shooting on site like their present-day equivalents, the American military take the three apes peacefully into custody, and scientists begin testing their mental faculties. Dr Milo is killed by a primitive gorilla, allowing for a Planet of the Apes movie with only two apes for the majority of its running time. In its first half, this is quite a light-hearted affair, flipping Taylor’s predicament from the first film on its head, whilst playing it for laughs. One man who isn’t laughing, though, is Presidential advisor Dr Otto Haslein (Eric Braeden), who is grappling with whether or not he should kill the apes to possibly prevent the takeover and destruction of the Earth from the previous films. 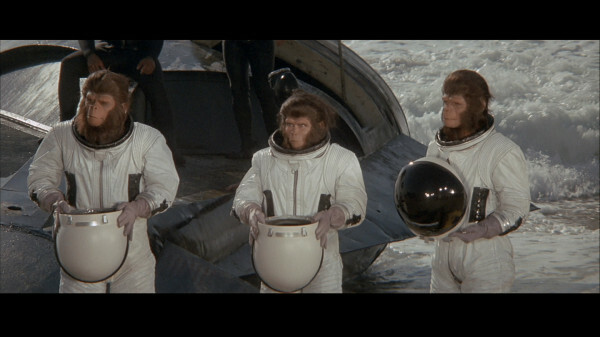 As Haslein’s machinations turn the tide of opinion against the apes, the human scientists who tested their faculties earlier in the film help them escape (sound familiar? ), and they wind up in a circus owned by Ricardo Montalban. As ever, Ricardo Montalban is AWESOME. His glee at having the first chimpanzee ever born in a circus is very charming, and his scenes are a lot of fun. 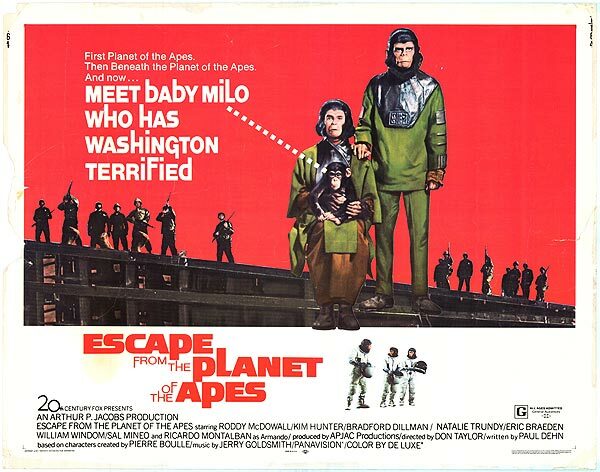 Which is pretty much the best way to describe Escape From the Planet of the Apes – it’s very charming, and a lot of fun. I really like this movie a lot. There’s not really much more to say. It’s well worth checking out. And it’s left open for another sequel; join us next week, where, in order to get everything out in time for the release of the new one, it will be a double-header; Conquest of the Planet of the Apes and Battle for the Planet of the Apes.